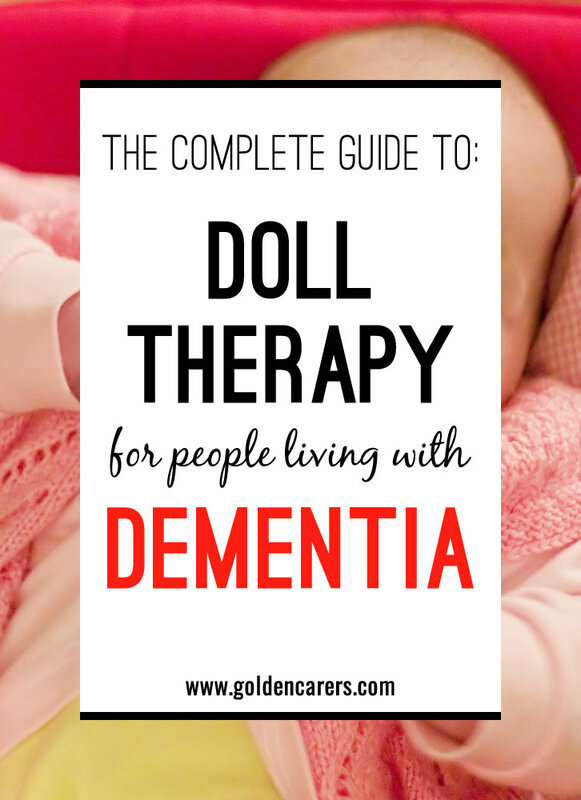 In the 1990’s, long-term care institutions were introduced to doll therapy with the aim of reducing behavioural and psychological disorders in people with dementia. Doll therapy is a non-pharmacological intervention suitable to some people living with dementia. The rationale was inspired British Psychologist John Bowlby’s ‘Attachment Theory’. Although Bowlby’s work focused on children, his theoretical explanation for attachment was thought helpful to apply in people with dementia to ease emotional problems and anxiety. Doll Therapy is also known as Child Representation Therapy and Nurture Therapy. Bowlby believed that attachment behaviors are instinctive and are activated by conditions that threaten the achievement of proximity, such as separation, insecurity and fear. Attachment behaviours can be observed in people with dementia. Parent fixation (searching for long deceased parents) is said to be an expression of an attachment need. This searching behaviour indicates that the person is insecure and seeking to be reunited with or attached to a familiar figure in order to find safety. Doll therapy can meet this attachment need in some people with dementia. Although conclusive research data has not yet been produced, positive anecdotal and empirical studies are gathering momentum. Doll therapy as a care tool is similar to other therapeutic interventions including music therapy, aromatherapy, art therapy and other sensory pursuits. As the number of people affected by dementia dramatically increases, more research into nonpharmacological interventions like doll therapy is taking place. This is fueled by concerns about the effectiveness and side effects of pharmacological treatments to manage the challenging behaviours of people with dementia. There are a growing number of care facilities embracing doll therapy as an effective intervention for people with dementia. Purchasing dolls that are as life-like as possible. Purchasing baby clothes, shoes, hats, and cribs for the dolls. Doll therapy is not for everyone and candidates should be carefully chosen. People who may benefit from doll therapy include those with Alzheimer’s Disease. More women than men will choose a doll to nurture, but some men do benefit greatly from holding a doll, so don’t rule them out. Assist residents with dementia to make their own choices by having them ‘find’ the doll rather than giving it to them. Leave it in a cot or lying on a table where it will be easily found. If a resident perceives the doll as a real baby, do not correct him/her. Make sure staff on other shifts are aware of this to avoid contradicting each other and the resident. Do not share dolls as this is bound to cause ownership confrontations. Infection control is another reason dolls should not be shared. Monitor fatigue in residents caring for dolls. If a doll has a name, use it; the doll should be treated in a manner conducive to how the resident perceives it. Do not use dolls to bribe or punish residents. Anxiety is diminished leading to a reduction in medication. I have witnessed the positive effects of doll therapy as an intervention numerous times in my working life. In my experience, the use of doll therapy promotes feelings of contentment in the person with dementia and improves their social rapport with staff. Doll Therapy can provide satisfaction and comfort to people with dementia. It provides them with the opportunity to nurture and satisfy an emotional need that wouldn’t be fulfilled otherwise. What has been your experience with doll therapy? This is lovely to hear Diana, I'm sure it is a wonderful comfort to her! How lovely Melody, the baby is probably a great source of comfort to her. I’m doing a college project on treatments for dementia, and am hoping to find an author for this writing along with the date published. I worked as a nurses aid be for nursing school in 1970, and a sweet granny always carried a baby doll around. She was always calm. I'd suggest a black-skin baby as well, even if your patients are all Caucasian. Some Caucasian mothers have long loved little African children. Multiple races of babies should be there. So very glad this is growing in practice! It fits in nicely in the games and toys in dementia units. Hi Ana, it depends on your set up. You may use a corner of the recreation area to keep the dolls. In this corner you should have comfortable chairs for clients to sit and nurse the babies. Also have a changing table, baby clothes and other baby related items. Usually the clients just enjoy holding the dolls. This activity can be daily for as long as there is interest. Hi Christine, a phycologist would be better able to advise you. My instinct tells me that if your mother thinks the baby is dead she may be grieving and suffering again for the baby. If that is the case, I would suggest to stop baby therapy and try again at a later stage (a few weeks). Hi! I found the doll therapy so interesting! I want to use it in the dementia area where I work but I don't know how to start it... Could you help me? What do I have to do? Should I tell my patient she have to take care? Or I give it like a present? Thanks! Hi Lola, you may show the baby doll to clients, and wait for their reaction. Usually they want to hold it. Otherwise just lay the baby doll on a crib or couch and let clients ‘find’ it. Be aware that clients’ family sometimes disapprove of it, despite its benefits. Good luck! How would you go about assessing if a resident is going to be suited for 'doll therapy'? Would you maybe bring the baby in for a 1:1 with the resident and see how they feel about the baby? Hi, we are looking to purchase a good baby doll for doll/baby therapy but are finding it difficult to find out where! The dementia shop seems to be out of stock & we really want to get the right kind! Can anyone help us? Is there anyone who has an assessment form for doll therapy? i use doll therapy in our facility firstly i researched for evidence of why this works for some and not other people then i printed off a simple to the point article for staff and found that staff in the beginning ,was a barrier to it working effectively but over time they are now all seeing the benefits . Then i purchased life like dolls and a crib and placed the dolls all wrapped up in there and waited for a response within an hour of setting up the display a lady saw the babies and went over and she asked me if she could look after this one , she instantly called the baby Thomas and cradled him , over the period of the day her whole outlook changed and as the days went on her need for medication decreased as she no longer was banging on the doors to go home because her children needed her . Staff now see the benefits and her family are just so pleased to see her happy and content. So to wrap it up you cannot really asses someone for doll therapy they will be drawn to it if the need is there then you have to put in place a management plan so the person doesn't get overwhelmed by the caring they need some down time , e.g. meal times , rest time , bed time .I hope my story helps you decide if you will give it a try if it meets one persons needs than you have done something fantastic . Nurture therapy is a wonderful way to encourage caring interaction in a person, male or female. careful observation of the individual will determine suitability, family and friends can give the staff valuable insight as to the suitability. There are many and varied interactive "babies" to choose from. During a singing session I often pass the lifelike baby doll around the group, the residents singing to the "baby". It creates a positive atmosphere and feelings of contentment. What can be more natural than the desire to hold and cuddle a baby, which brings back so many memories for residents. No point analyzing the "therapy", just enjoy the moment. Agreed Nurture therapy is a much better name. We use this therapy at our facility but is not for everyone. For some of our residents it is a very beneficial activity, calming the resident and actually giving that resident some enjoyment, minimising behaviours, so it's a win win as far as I am concerned. yes great article we already have introduced doll therapy don't forget to get a signed document were family agree for there loved one to have. DMAS in Tasmania do supply lifelike dolls at a price. ....Nature Therapy or Nurture Therapy? Call it what suits the culture in which it is used. This (as for any therapy) work with, & for, some dementias but not for other types (or different resident mix). If staff are accepting and non judgemental (as they should be) then others will be too... It is great for residents to have feelings and emotions of any type! Used to love doll therapy until a resident, and those near her, became very distressed by the "dead" baby because it did not move. Now have interactive kitten, the small one. When this kitten has not moved for some time, a cuddle/stoke will cause it to move. So as always we need to monitor. I use doll therapy at my facility, one man who has since passed away used to sit and cuddle the doll in the evenings, it stopped him roaming the hallways, he thought it was one of his grandchildren. He would rock and sing to her, I found doll therapy to be very successful with him, it curbed his behaviors. Nurture therapy is a great term, but i haven't had any negative feedback from other staff or residents families at this stage, so will continue with our 'Doll therapy'. I am still sitting on the fence with doll therapy. I have seen it work very successfully for some residents but I have also seen it back fire and become another behaviour issue. I think as Diversional therapists we need to ensure that we have assessed the person correctly for this therapy, ensure that staff and family are on board with it before we try it. At the end of the day if you have a calm content resident then it was the right thing to do. I like the term Nuture therapy rather that Doll therapy. At our facility we use a "reborn" doll which is life-like for 1x1 or group therapy use and the usual kind of baby doll for our dementia unit were residents wander and or hold the dolls all the time. We call it "Nurture therapy" on our programming due to the negative connotations of "doll therapy". This site is amazing! I'm not sure how I survived before I was introduced to this! Something for every occasion! So many ways for the clients to reminisce and learn about new things. Well worth the membership fee. Thank you! I have only just found you and I have been overwhelmed by the content. A week ago, I was contemplating leaving my job because I was just running out of ideas and I was getting bored doing the same old things. Not now! Thank you!